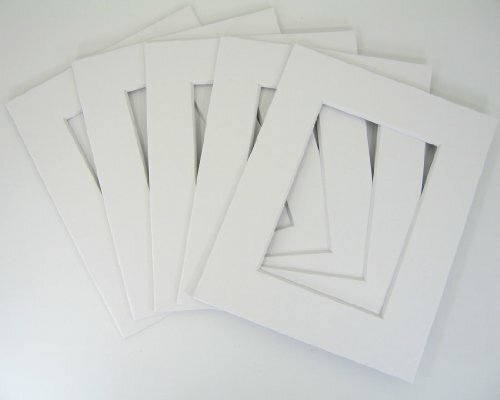 50 set of White 12x16 Photo Mats for 8x12 + backing + bags by Golden State Art at Aulainter Americana. Hurry! Limited time offer. Offer valid only while supplies last. Any question? Please call us at 650-226-8119. The resealable adhesive strip of the clear bag is below the opening of the bag instead of on the flap. View More In Matting & Mounting Materials. Any question? Please call us at 650-226-8119. The resealable adhesive strip of the clear bag is below the opening of the bag instead of on the flap. Our acid-free white core mat boards are a 4-ply paper mat that provide the aesthetic and design benefits of a bright white bevel., Each sheet of mat board has a richly colored front surface, a white core and a white backing. It can be used for matting photos, art, and needlepoint. Also great for crafts, backboards, signs, children's projects, and school projects. This item comes with 50 single mats, 50 backing, and 50 bags. The opening size is 7.5"x11.5" for 8x12 print with a bevel cut. The mats are beveled cut with white core and 4-ply thick (about 1.4 mm or 1/16 inch). If you have any questions about this product by Golden State Art, contact us by completing and submitting the form below. If you are looking for a specif part number, please include it with your message.